Law students gone wild? What happens in Vegas doesn’t stay in Vegas when the allegations get this ugly. A pair of men who appear to be Boalt Hall law students have made national — and even international — news. Keep reading for the disturbing allegations against them…. Police say the men claimed to study at the University of California, Berkeley School of Law, and had student identification cards. It’s not clear if they have attorneys. Scissors .. Quote from a kindergartener’s mom: "This is my kindergartener’s artistic rendering of a pair of scissors. I wonder what his teacher thought. And I am so dang proud of myself. I allowed myself just a small smirk when I saw it. I waited until he was out of the room before I started to cry from laughing so hard." LAS VEGAS — A shocking charge against two Cal law students — the 24-year-old’s were arrested after police say they killed and decapitated an exotic bird that was part of a Las Vegas resort attraction. Eric Cuellar and Justin Teixeira were jailed Friday afternoon on suspicion of conspiracy and willful malicious killing of wildlife. Police say the two men were seen Friday laughing and throwing around the body of a dead, 14-year-old bird at the Flamingo resort-casino. The bird was a helmeted guineafowl, like the one pictured above. It was part of the Flamingo’s Wildlife Habitat, a garden area with ponds and streams that houses many types of birds. Authorities say surveillance video captured the men chasing the bird into some trees. Witnesses say the two emerge carrying the body and severed bird head. img code photo … Eric Cuellar (left) and Justin Teixeira (right). Cuellar looks addled; Teixeira looks cute. — In an apparent attempt to empirically prove the veracity of Robert Frost’s 1962 poem “Nothing Gold Can Stay,” two men, Eric Cuellar and Justin Teixeira, were arrested in Las Vegas this week after being caught on tape killing an endangered 14-year-old helmeted guinea fowl. — Security footage at the painfully named Flamingo Hotel showed them throwing the bird back and forth while laughing and discussing how they would kill it, because there is nothing good or innocent that will not eventually be brutally murdered. The two were identified as Berkeley law students because of course they are. Thank you, gentlemen, for enhancing our profession’s already stellar reputation. — Security officers saw them emerging from a nearby grove with the decapitated corpse of something that was once beautiful, as well as the head itself, after which we can only assume the officers took a moment to privately weep for humanity’s collective loss. The men refused to speak to police or identify themselves in any way, presumably because they were supernaturally rendered speechless by shame and grief. Exercising the Fifth Amendment privilege against self-incrimination? Looks like someone was paying attention in Crim Pro class. — The two face felony charges for torturing and killing endangered wildlife; no word yet on what punishments await reporters who use the phrase “fowl play” in introducing the story. We’ll probably have more to say about this on Monday. Remember, of course, that we’re dealing only with allegations at this point. Cuellar and Teixeira haven’t commented, so we don’t know their side of the story or what might have been motivating them. According to the Daily Mail, the police do not believe drugs to be involved (no word on alcohol though). If you know Eric Cuellar or Justin Teixeira and can provide us with additional information about them, please email us or text us (646-820-8477). Thanks. 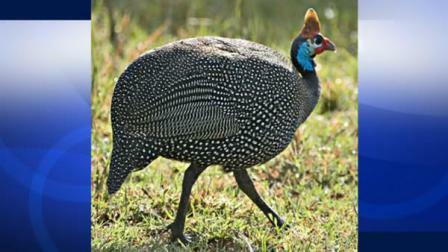 UPDATE (10:50 PM): For the record, as noted in the comments, the helmeted guinea fowl is not endangered. Cuellar and Teixeira face felony charges of conspiracy and the willful, malicious torture or killing of wildlife. Endangered status is not an element of the offense. The Black Museum of Scotland Yard is a famed collection of criminal memorabilia kept at the headquarters of the Metropolitan Police in London, England. The museum came into existence sometime in 1874, although unofficially. It was housed at Scotland Yard, and grew from the collection of prisoners’ property gathered under the authority of the Prisoners Property Act of 1869. The act was intended to help the police in their study of crime and criminals. By 1875, it had become an official museum of the force, with a police inspector and a police constable assigned to duty there. The first visitors for whom records exist came in 1877. The first known reference to the museum as the "Black Museum" came that year as well. Despite being intended primarily for use by the police, the public could see it by special arrangement. The name "Black Museum" was a nickname; the collection was formally referred to as the "Crime Museum." The term was also applied to a museum of failed engineering components collected by David Kirkaldy at his testing works at 99 Southwark Street, Southwark, London. The latter museum was destroyed in the London Blitz. The artefacts included fractured lugs from the Tay Bridge disaster. The exhibits included many death masks made of executed criminals, as well as collections of weapons, tools used by burglars, and items that had been evidence in crimes. In 1951, British commercial radio producer Harry Alan Towers produced a radio series hosted by Orson Welles called The Black Museum, inspired by the catalogue of items on display. Each week, the programme featured an item from the museum and a dramatization of the story surrounding the object to the macabre delight of audiences. Often mistakenly cited as a BBC production, Towers commercially syndicated the programme throughout the English speaking world. The American radio writer Wyllis Cooper also wrote and directed a similar anthology for NBC that ran at the same time in the U. S.; called Whitehall 1212, for the telephone number of Scotland Yard, the program debuted on November 18, 1951, and was hosted by Chief Superintendent John Davidson, curator of the Black Museum. The Museum was moved to New Scotland Yard in the 1980s and was subject to substantial renovation in recent years. The Crime Museum, as it is now called, currently resides in Room 101 at New Scotland Yard and consists of two sections. The first, a replica of the original museum contains a substantial selection of melee weapons, some overt, some concealed, including shotgun umbrellas and numerous walking stick swords. This room also contains a selection of hangman’s nooses including that used to perform the UK’s last ever execution and letters allegedly written by Jack the Ripper. The newer section of the museum contains many exhibits from 20th century crimes, notable inclusions include the fake De Beers diamond from the Millennium Dome heist and Dennis Nilsen’s stove. The museum can be visited by Police officers from any of the country’s police forces by prior appointment, though not without difficulty due to its popularity. The Black Museum of criminal artefacts also hosts over 500 items preserved at a constant temperature of sixty-two degrees, a special place is reserved for a set of printing plates, a remarkable series of forged bank-notes, and a cunningly hollowed out kitchen door once used to conceal some of them, once belonging to Charles Black, the most prolific counterfeiter in the Western Hemisphere. For more than a century, Scotland Yard’s “Black Museum” has catalogued artefacts from the most gruesome crimes of London — and the exhibits have been considered too horrible to be shown to the public. Generations of police officers have been granted access to its dimly lit rooms, to see the ghastly relics. For almost everyone else, it has remained off limits. This restriction in the name of public decency may be about to end. Boris Johnson, the Mayor of London, is backing a plan to turn some of the exhibits into a tourist attraction, a museum to celebrate the capital’s emergency services. The Black Museum includes objects from the Jack the Ripper and Dr Crippen cases — Crippen was in 1910 convicted of murdering his wife and disposing of the body in a bath of acid — and a horrible pair of binoculars. In 1869 Parliament gave the police the authority to retain certain items of prisoners’ property for instructional purposes. An Inspector Neame initially gathered together a collection for training purposes, and the first visitors — the top brass at the Yard — inspected the museum in 1877. When that same year a journalist was denied access to the collection, he named the collection the Black Museum in his subsequent report. The name stuck. It is currently housed in two rooms on the second floor of New Scotland Yard, overseen by Alan McCormick, a retired police officer. The lighting is dim to avoid bleaching exhibits. The oldest exhibit is a pair of handcuffs used in 1841 to restrain a mutineer. There is weaponry, including swords concealed in walking sticks — and the poisoned umbrella used in 1978 to kill the Bulgarian writer and dissident Georgi Markov on Waterloo Bridge. A briefcase designed to fire a poisoned dart into witnesses on the steps of the Old Bailey — former property of the Kray twins — is also in the collection. They never got to use it. Then there are those infamous binoculars: when the lenses are screwed into focus a pair of spikes shoot out to blind the user. Among the more recent exhibits in the museum is the bloodstained uniform worn by PC Keith Blakelock, the officer killed in the Broadwater Farm riots in Tottenham in 1985, and a section on the serial killer Dennis Nilsen. Parts of the bathroom in which Nilsen hid bodies are in the Black Museum. For the moment, such artefacts are seen only by police officers and associated professionals as part of their training. MPs and ambassadors have also visited. The idea is that items would go on display in a “Blue Light Museum”, alongside artefacts from the history of the London ambulance and fire services. Yesterday Andy Hayman, former Assistant Commissioner of the Metropolitan Police, broadly endorsed the mayor’s plan for an exhibition, describing the museum as “the Madame Tussauds of the Yard”. Mr Hayman said: “I was rather apprehensive the first time I visited the museum. I wondered if I was being voyeuristic and disrespectful to the victims and their families. “After a few moments, however. those concerns were replaced with fascination and interest. “This museum presents such well-kept artefacts of significant historical value it seems a shame the general public do not have the opportunity to have this experience. “I’m very fortunate that my parents survived. I often think about those who didn’t, because my father always liked to say that he was the ‘worst of his seven brothers and sisters.’ Everyone else perished in Treblinka. He used to say they were all smarter than him and were better human beings than him. He had survivor guilt to the day of his death. He had the book Treblinka on his nightstand for 20 years. He read and reread it. BUDD SCHULBERG and Elia Kazan, the writer-director team whose "On the Waterfront" manifested the rare congeniality of their skills, are doing a brisk encore in tracing the phenomenal rise (and fall) of a top television "personality" in their new film, "A Face in the Crowd." This sizzling and cynical exposure, which came to the Globe last night, also presents Andy Griffith as the key figure in his first screen role. Like other debunking films before it that have gleefully discovered feet of clay on seemingly solid public idols, this one is more concerned with the nature and flamboyance of the idol than with the milieu and machine by which he is made. Lonesome Rhodes, the two-faced hero, is pretty much the whole show, and what he symbolizes in society is barely hinted—or discreetly overlooked. From the outset, when he is picked up as a drunken guitar-playing tramp by a female television reporter in an Arkansas town, he progres-sively dominates the TV audience to which he is expandingly exposed, the advertising agency representatives and the big industrialist by whom he is employed. He even is coming close to dominating a political faction and a Presidential aspirant when the rug is suddenly pulled out from under him by his girl friend, who throws a studio switch. Meanwhile, he is demonstrating his eccentric personality—his gusto, his candor, his shrewdness, his moral laxity and his treachery. And, from the way his eyes narrow and his lips tighten, we gather he is demonstrating a thirst for power, when his loving and loyal discoverer decides that we’ve all had enough. In a way, it is not surprising that this flamboyant Lonesome Rhodes dominates the other characters in the story and consequently the show. For Mr. Schulberg has penned a powerful person of the raw, vulgar, roughneck, cornball breed, and Mr. Griffith plays him with thunderous vigor, under the guidance of Mr. Kazan. You know you are in the vicinity of someone who has white-lightning for blood when Mr. Griffith first hits old "Mama Git-tar" and howls his "Free Man in the Morning" song. And you know you are up against a trickster when he starts spouting amiable lies. Mr. Schulberg and Mr. Kazan spawn a monster not unlike the one of Dr. Frankenstein. But so hypnotized are they by his presence that he runs away not only with the show but with intellectual reason and with the potentiality of their theme. Lonesome Rhodes builds up so swiftly that it is never made properly clear that he is a creature of the television mechanism and the public’s own gullibility. He swings in an ever-widening orbit, as it were by his own energy and not by the recognized attraction and governance of a new magnetic field. Everyone condescends to him—in the script of Mr. Schulberg, that is—instead of taking positive positions that would better represent reality. Patricia Neal as his doting discoverer, Paul McGrath as an advertising man, Percy Waram as a big manufacturer, Marshall Neilan as a scheming Senator and Anthony Franciosa as a wise guy—all play their roles capably, but they’re forced to behave as awed observers, not as flexible factors in the scheme of things. As a consequence, the dominance of the hero and his monstrous momentum, driven home by a vast accumulation of TV detail and Mr. Kazan’s staccato style, eventually become a bit monotonous when they are not truly opposed. Reality is proved by inadvertence. We finally get bored with Lonesome Rhodes. Thus the dubious device of having his girl friend switch him on the air when he thinks he is finished with his program (and is scorning his public) is inane. This type would either have become a harmless habit or the public would have been finished with him! Withal, he is highly entertaining and well worth pondering when he is on the rise. A FACE IN THE CROWD, story and screen play by Budd Schulberg; directed and produced by Elia Kazan for Newtown Productions; a Warner Brothers presentation. At the Globe. Will Recant, son of Holocaust survivors, is one of the world’s top experts in emergency relief and disaster assistance programs. It was one of the most devastating days in the history of mankind. The final death toll will never be precisely known, but more people perished in the massive 2004 Indian Ocean earthquake and tsunami than in the combined atomic bombings of Hiroshima and Nagasaki. Will Recant was on holiday with his family when the devastation struck. Recant, the senior executive in the American Jewish Joint Distribution Committee (JDC, or Joint) responsible for nonsectarian programming, raced back to his New York desk and labored through field representatives and other local partners to set up a relief system and distribute food to survivors. He traveled to the hardest-hit area in Indonesia, slammed by 30-foot-high waves. After three weeks, he traveled to perhaps the hardest-hit area, Banda Aceh, in northwest Indonesia, which had been slammed by 30-foot-high seismic sea waves. The details of widespread devastation, along with many others from Will Recant’s 30-year career in disaster relief, are well-etched into his memory bank. He has spent more than half of every one of those 30 years on road trips, organizing relief efforts on behalf of victims of natural disasters, wars, and poverty. Recant is chiefly responsible for helping to assess the overall picture, determine the most pressing needs, coordinate rescue and relief efforts with local partners and international relief agencies, and ensure that reconstruction and redevelopment aid is utilized as intended. The JDC’s main mission, which sometimes dovetails with Recant’s work, is to help Israel and Jews in need around the globe. The nonsectarian programs Recant pilots are funded by special, external campaigns. Where is Recant headed to next? The answer to that question may well be dictated by the next 8.0 earth tremor on the Richter scale, but this particular morning is a placid one at JDC headquarters on Third Avenue in Manhattan. Will is making his final preparations for a trip to Ethiopia to review humanitarian programs that have run the gamut from building schools, digging wells, helping children in need of spinal surgery, and de-worming rural villages. After that, he will head to Rwanda for a dedication ceremony at the Agahozo-Shalom Youth Village, built with JDC assistance five years ago for orphan teenagers of the Rwandan genocide — the mass murder of hundreds of thousands of ethnic Tutsis over a bloody, 100-day period in 1994. Recant’s self-assured manner befits the major accomplishments under his belt, yet he refuses to accept credit. It’s a lesson he says he learned at his previous position as executive director of the American Association for Ethiopian Jews. The AAEJ was a major player in Operation Solomon — the dramatic 1991 emergency airlift of nearly all of Ethiopia’s 14,500 Jews in less than 36 hours. Recant’s role in Operation Solomon included advocacy in Washington, DC’s, halls of power to increase attention to the plight of Ethiopian Jews, and helping raise the estimated ,000 required to transport each Jew to safety. It’s a privilege, as the child of Holocaust survivors, to help bring Jews to Israel. Some of that money was used to produce false documentation inviting Jews to come and work or visit the US under family reunification plans, or even to smuggle them physically out of Ethiopia, via Sudan or Kenya, to Israel. Sometimes the smuggling was done by car, at other times by means that Recant still does not feel at liberty to discuss. “There were myriad ways of rescuing Jews. For me, it was really a privilege, as the child of Holocaust survivors, to help bring these Jews to Eretz Yisrael, to the land of their dreams,” says Recant. Recant’s father hailed from Vengrov, a small shtetl in Poland, east of Warsaw. He fled eastward during World War II, but the Russians arrested him as a German spy and sent him packing to frigid Siberia. As the war dragged on, the Russians decided Mr. Recant would be of greater value to them as a soldier, so they released him to the Polish army under Russian command. Will’s mother was also a Polish native. She hid for more than three years during World War II in the neck of Belarusian woods made famous by the movie Defiance, which celebrated the Bielsky brothers’ partisan operation. After World War II, the Recants ended up in America, met, and married. “I’m very fortunate that my parents survived. I often think about those who didn’t, because my father always liked to say that he was the ‘worst of his seven brothers and sisters.’ Everyone else perished in Treblinka. He used to say they were all smarter than him and were better human beings than him. He had survivor guilt to the day of his death. He had the book Treblinka on his nightstand for 20 years. He read and reread it. He was the first yeshivah graduate to receive a Division I athletic scholarship. Baseball was also a big draw for Will. He was the first yeshivah graduate to receive a Division I athletic scholarship and played third base at the University of Louisville. Although Kentucky’s southern gentility clashed with his New York sophistication, Will says he appreciated those years as an opportunity to be up front about his Judaism. Eventually, he earned a PhD in political science at George Washington University, which fueled his interest in international affairs. The contacts he built in Washington during his Operation Solomon years came in handy in the early 1990s after the fall of Communism, when Cuba began its shift from an official policy of atheism to allow a measure of religious tolerance. Will made his first trip to Cuba in 1992, shortly after joining the JDC. Before Cuba formally amended its constitution, if a Jew attended synagogue services, he was precluded from becoming a communist party member. After the constitutional change allowing practicing Jews to participate in the political process, Dr. Jose Miller z”l, president of Cuba’s Jewish community, called the JDC for help. The community was in shambles. It had had no functioning rabbi since the 1960s, when Fidel Castro seized the reins of power. “We want your assistance in being a community again,” Dr. Miller told Recant. Recant heeded the cry for help, and traveled to Cuba. There, he and leaders of the local Jewish community literally knocked on the doors of all the Jewish families listed in the 1950s censuses. They explained the new law and invited the people to Shabbos services, which were to be held in the basement of the Patronato (Havana’s JCC), which had fallen into neglect. When Shabbos arrived, Recant sat in the basement with a small group of other men, including Dr. Miller, waiting for a minyan. At age 72, Dr. Miller was the youngest member of the Cuban contingent. Fifteen years later, Recant found himself in the newly renovated Patronato, face-to-face with Dr. Miller — as it turns out — two months before the elderly activist passed away. “And he said, ‘Absolutely and thank God, thanks to my community, and thanks to the Joint, I was wrong. Recant’s daughter Jennifer accompanied Will on one of his trips to Cuba shortly before her bas mitzvah. Since she knows some Spanish, she was able to converse with the Cuban youth. During the course of the conversation, she learned that six of them were also her age, none had undergone a bar or bas mitzvah, and in fact there hadn’t been a bar or bas mitzvah in Cuba since the 1960s. It costs about 0 per youth to provide them with bar or bas mitzvah training, as well as pairs of tefillin, talleisim, a Tanach, and candlesticks. Jennifer herself donated the money for the first six bar and bas mitzvahs, which were held at a gala gathering for more than 600 Cuban Jews. The sign “Am Yisrael b’Cuba chai” may not have been hanging anymore, but it was no longer needed. The results were speaking for themselves. Until 1991, the south European nation of Yugoslavia was comprised of six republics: Slovenia, Croatia, Bosnia Herzegovina, Serbia, Montenegro, and Macedonia. Serbia was further divided into two autonomous regions: Kosovo and Vojvodina. By 1991, the Yugoslav republics began clamoring for independence. A Serbian minority in Croatia declared their own state and embarked on an ethnic-cleansing campaign, killing more than 10,000 civilians. Serb units even emptied a hospital of Croatian patients and executed them in a nearby field. After a negotiated cease-fire, Serb forces partially pulled out of Croatia, taking up new positions in neighboring Bosnia, home to a sizable Serb minority. In 1992, Bosnian Serbs launched their own ethnic cleansing campaign, killing more than 200,000 civilians. Half of Bosnia’s four million people fled the country. As they fled, Will Recant entered. The JDC had already been working with the Jewish community in Sarajevo, Bosnia, through La Benevolencija, a Jewish humanitarian association formed 100 years ago to promote the general welfare of the population irrespective of religion or nationality. Now, as the region deteriorated into a genocidal bloodbath, aid programs were increased. In 1999, after years of dithering, NATO forces finally launched an aerial bombardment against Serb military targets. Serbia responded with an all-out genocide campaign to ethnically cleanse Kosovo of its Albanian population, driving hundreds of thousands across the border into refugee camps in Macedonia, Albania, and Montenegro. Skopje, Macedonia’s small but well-organized 180-member Jewish community was among the first responders when Kosovo refugees streamed into Macedonia, but soon it was time to flee again. “When the refugees saw the NATO bombing and the Serbs leaving, they just started to flock back in themselves in a disorganized, unplanned manner, just as they had come out,” says Recant. Even in chaotic situations such as these, Recant has learned to make coolheaded evaluations. Experienced international relief organizations and their field partners prepare situation reports. The United Nations, through its Office for the Coordination of Humanitarian Affairs (OCHA), assists governments in mobilizing international assistance when the scale of the disaster exceeds the national capacity. At times, finding open lines of communication is itself the issue. Haiti’s 2010 earthquake was a natural disaster of a scale equivalent to the 2004 tsunami, in terms of loss of life and destruction. Rescue efforts were hampered because telephone service on the island nation was knocked out, although some cellular phone systems were operating. Recant’s first order of business was to secure the names and addresses of the ten known Jewish families in Haiti. Once again, local Jewish help was indispensable. “A Jewish family who owned the soccer stadium donated it for use when the IDF set up its initial field hospital,” says Recant. Recant says that from his experience, survivors can normally be found for the first four or five days after natural disaster strikes, especially if there are eyewitnesses who can convey accurate information as to people’s whereabouts. “A gift of the Jewish community of Morocco” was embroidered in Arabic on the back of every wheelchair. One of the students, named Oscar, was one of three survivors from his 12th-grade class. His right leg had to be amputated after a building collapsed on him, killing 54 of his classmates. The Israeli medical team from the IDF, JDC field partner Magen David Adom, and Tel HaShomer Hospital fit Oscar for a state-of-the-art prosthesis. Oscar has since learned to walk again, without assistance. Several years ago, Recant spearheaded an effort with a partner association in Morocco to deliver a container of wheelchairs to Morocco. The words “a gift of the Jewish community of Morocco” were embroidered in Arabic on the back of every wheelchair. “Morocco’s king went on national television to say thanks to the fact that we have 4,500 loyal Jewish citizens who care not only about themselves but about others; our kingdom is enriched and we all benefit,” said Recant. While his position clearly affords him the opportunity for humanitarian accomplishments on a daily basis, Recant says a couple of enduring goals keeps him motivated. “First, no Jew should be going to bed hungry, anywhere in the world. “And you know, it’s a big world. There are a lot of needs out there. I get to see the good, the bad, and the ugly. The good is great and the bad can be horrendous, especially what man does to man. This article originally appeared in Mishpacha Magazine.